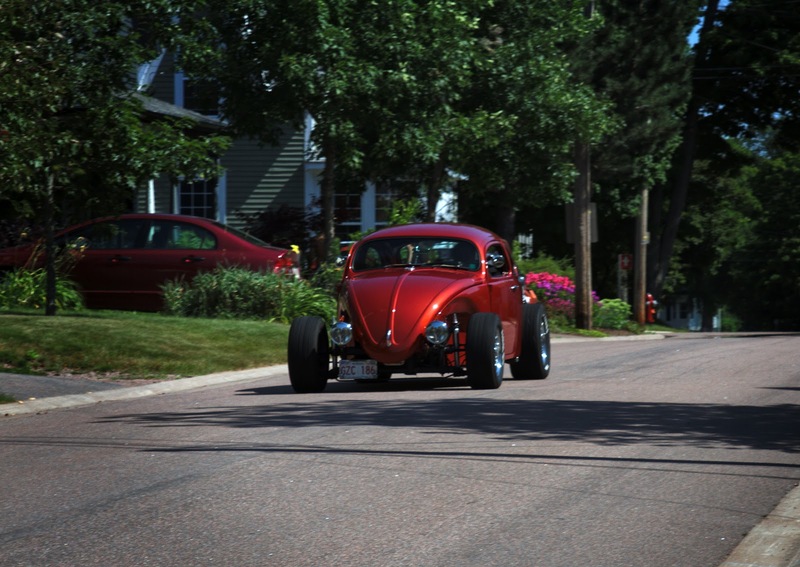 I took this picture of a nice hot-rodded Bug during my SappyFest street shoot, on my way home. It wasn't really related to SappyFest so I didn't do anything with it until now. This is one of those pictures which shows that I am enthusiastic about using Post Processing (PP) in creating my personal style. There is some debate about this among photographers, whether PP should be relied upon, or if a "personal style" of photography should come straight from the camera. I may be wrong about this, but those who are strong of opinion one way or the other, also fall into the Digital vis Film camps. I am not strong of opinion either way, because I really admire film photography, and as I've said before on a couple of occasions, all of the really cool cameras are film cameras. The trouble is, I simply cannot bring myself back to using film - some of my best shots were made with film, but I'm now too far gone Digital. But enough about that. I shot this picture through my Jupiter-9 Lens - a Russian gem which is very fast, has beautiful glass and an amazing 11 blade aperture. 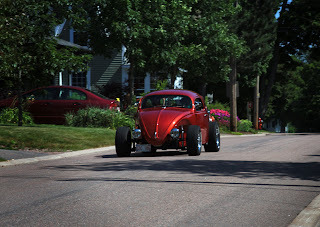 It was a bit tricky, as obviously this is a very old manual focus lens, I had it fairly opened up to f5.6, so the depth of field (DOF) was still quite shallow, and the car was moving. I'm amazed I was able to keep it in focus, but by good luck (and the very helpfully superb EOS 7D viewfinder) I managed to keep a bead on the car. Now, here is a perfect example as to why I insist on having a great optical viewfinder with manual focus assist. If you look closely, I think my focus is a wee bit soft- I was actually focussed more in the front of the car, but under these circumstances, it came off well. So, with a good shot to start with, (no matter what, you always need a good photo) I went to Post Processing to see if I could really turn this into something more like art. The first thing I noticed besides I did a pretty god job focussing on the Bug while having everything else de-focused, was how most of the light was also on the Bug, and most everything else was in shadow. I decided to put more emphasis on this. Although the original exposure was perfect, the first step was to reduce the EV by one stop (using the RAW file in Photivo). This darkened the whole picture, but the shadow zones got even darker - perfect start. Next. I did everything I could to raise the exposure of the highlights only - Photivo has a number of different ways of doing this - I tried them all. The effect of each step was very subtle, but as each accumulated, the Bug began standing out more and more from the background, which remained dark and fuzzy. I left the mid-tones alone and concentrated only on the highlights. Finally, although it wasn't really necessary, I thought I'd try some Vignetting (a circle of darkening usually produced by very cheap lenses, but can also be added for effect with PP software). I made the Vignette soft but noticeable, and it helped even more to keep the Bug in the spotlight, while also keeping the overall context of the picture. A fairly easy Post Processing procedure, but it's also important to note that I had a good capture that was already started with the focussing and lighting emphasis this picture needed to turn it into something that suited my personal style.